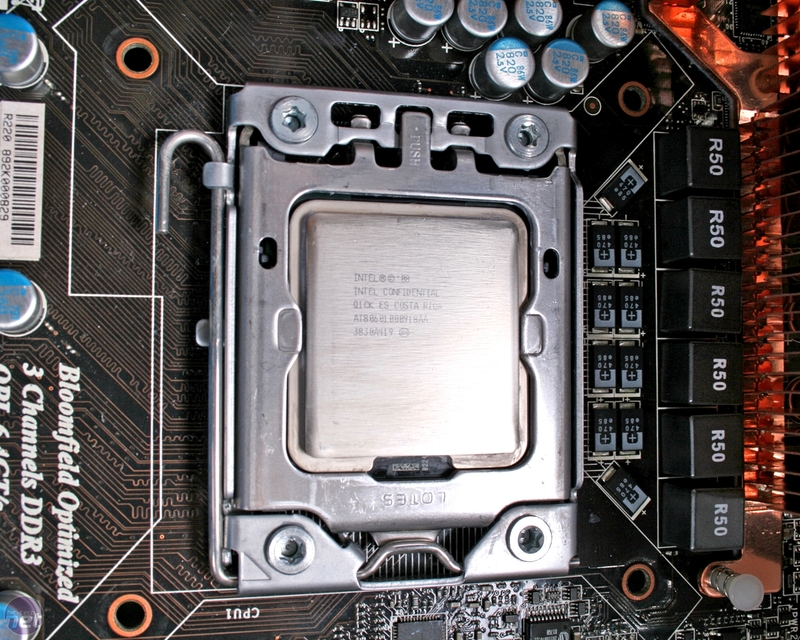 Now Intel’s new LGA 1366 socket and Core i7 platform has been on sale for a good few months, we’re finally starting to see a decent variety of coolers released that support Intel’s latest CPUs. We're also seeing the much anticipated mounting brackets for old favourites appear at e-tailers. As we’ve seen plenty of times before though, just throwing a tonne of copper heat pipes and a football pitch worth of cooling fins at a CPU doesn’t necessarily result in top class cooling. Picking a good CPU cooler can be tricky at the best of times and small differences in materials, design and build quality can lead to big differences in cooling performance. The problem gets even trickier now that all Intel’s Core i7 processors require a whopping 130W TDP (Thermal Design Power) of cooling to keep them working safely at load. 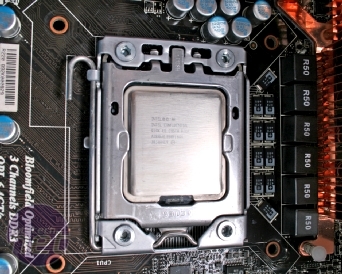 This means that the more compact coolers we’ve looked at in the past like the Arctic Cooling Freezer 7 Pro or Akasa 965, both perfectly capable of handling almost any dual or quad core chip, are now somewhat out of their depth with Intel’s latest power hungry chips (not to mention sporting incompatible mountings). To this end, we’ve gathered the pick of the latest crop of heavy hitting LGA 1366 heatsinks, as well as a number of Core i7 re-releases for some of our favourite coolers for a cooling showdown. We've put them to the test atop our new Core i7 heatsink testing rig, which we’ve conveniently pinched from our colleagues at Custom PC (yoink! - Ed.). Fitted with an Intel Core i7 Extreme 965 overclocked to 3.6GHz with a core voltage of 1.3V, it represents the absolute worst case scenario for a modern CPU cooler – rest assured if a heatsink can keep this chip stable and cool it’ll be more than up to the task of cooling any retail CPU on the market today, overclocked or not. 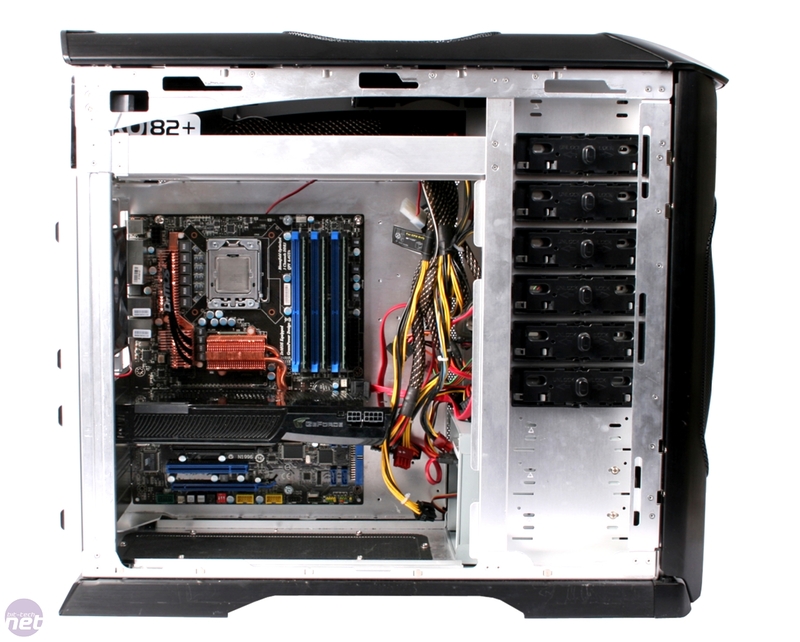 Click to enlarge - Behold our new LGA 1366 test system - its job is to make heatsink manufacturers cry. Coupled with the toasty processor are MSI’s X58 Eclipse motherboard, a Zotac GeForce GTX 280, 3GB of OEM PC3 8500 DDR3 and an Enermax Pro 82+ power supply, all housed inside a Cooler Master Stacker chassis chosen for its roomy interior and conventional front to pack cooling layout. This means that we don’t go insane trying to mount monster coolers into a confined case, and you get a fair idea of cooling performance to expect in your own system, although we’ll still be on the lookout for coolers that might have trouble fitting in smaller chassis or have flawed mounting mechanisms.